According to the 2000 Census, West Carroll Parish, Louisiana has a population of 12,314 people. Of those, 9,838 (75%) are White, 2,325 (17%) are Black, and 166 (1%) are Latino. 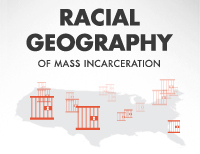 However, 579 (or 5% of the 12,314 people) are not residents by choice but are people in prison. A more accurate description would not include the prisoners. This would give West Carroll Parish a population of 11,735 with a demographic that is 83% White, 16% Black, and 1% Latino.